Today marks our 6th month of island living! Can you believe it? 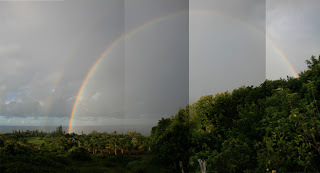 In honor, the island gods treated us to quite a show with a 40 minute long FULL ARC-DOUBLE-RAINBOW. As you can see, it was unbelievable. These pictures were in no way manipulated or enhanced. Except for the full shot which was only pasted together. What you see is exactly what we saw. That's our orange shed door right under the end of the rainbow. Too bad there was no pot of gold. 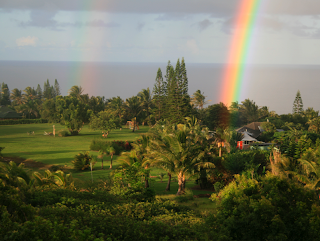 Shoot, the whole place is a pot of gold. That rainbow is so brilliant! 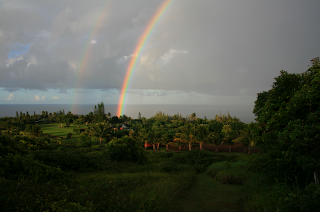 Love your blog, I used to live on Maui, so it's nice to see you are embracing Island life. And to think, I was there the day it started! Congrats!